The AH-550 has a mouth diameter of 300mm and an axial length of 205mm to a 1” throat. Throat sizes can be made up to 2” diameter. The Le Cléac’h flare rate is 550Hz at 0.8 T factor, calculated from a 1” throat size. The Le Cléac’h flare rate is 425Hz at 0.707 T factor calculated from a 1.4” throat size. The AH-340 has a mouth diameter of 600mm and an axial length of 340mm to a 1.5” throat. The horn sports the complete Le Cléac’h flare back. Throat sizes can be made down to 1”. The Le Cléac’h flare rate is 340Hz at 0.8 T factor calculated from a 1.5” throat size. 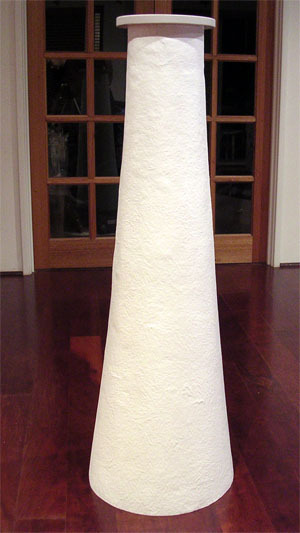 A version with a mouth diameter of 510mm is available (minimum roll back – looks more like the 425 and 550 horns). Larger throat models can be airmailed. The standard AH-204 has a mouth diameter of 800mm, with a throat of 170 mm (+/- as required) and an axial length of 310mm when made for 8” Lowthers. 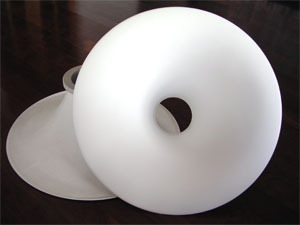 A version with a mouth diameter of 650mm can be made. Throat sizes can be made for smaller cone drivers or compression drivers down to 2” from a one piece mould. The Le Cléac’h flare rate is 204Hz at 0.8 T factor calculated from a 168mm throat size. The 160 was the original Azurahorn, now available again from an accurate new mould. 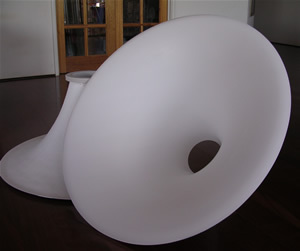 This is a large horn with 950mm mouth. The axial length is 450mm when made for 8” Lowthers. .
A flanged extension for throat sizes down to 1.4” can be made. The Le Cléac’h flare rate is 160Hz at 0.8 T factor calculated from a 1.5” throat size. 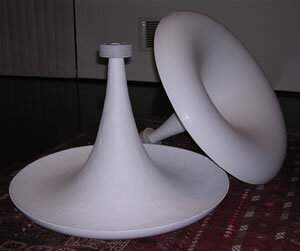 The ABH-50 Bass Horn is a 50Hz L-shape bass horn with a mouth area of 7700 sq cm proportioned to the Golden Mean. Throat diameter is 170mm and overall length is approx 2.3m. The expansion is 48Hz / 0.6 Hypex calculated using David McBean’s HornResp. Not available for sale – offered as plans and inspiration only – though I do have moulds for the vertical section if needed by local die hard. 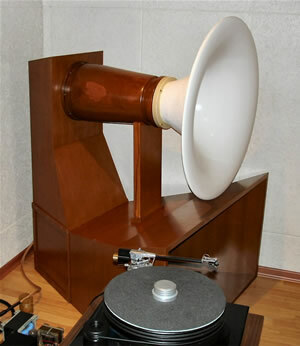 The AH-PP Horn consists of a 204 front horn mounted on a folded plywood bass horn to the same expansion as above. The horns pictured have rear sections turned from solid Teak, but a square ply section can be used. Azurahorns are of glass-fibre composite construction. The white colour is an integral gel coat – ie it is the first layer on the mould – not spray paint. 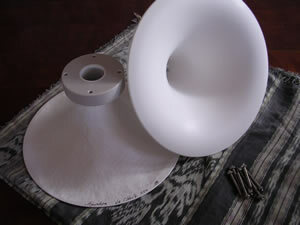 Matt white Flowcoat be applied to the back of the horn, thickened with Q-cell for damping. Horns are made to order and production runs are not necessary. However capacity is limited. Colour is restricted to white. The horns should be lightly faired to remove the hard glossy Fibreglass look. This gives them a soft white silky finish, like alabaster. It makes a good base for custom spray painting if desired. Flanges may be cast onto the horn after cutting the throat to the specified diameter. The mounting holes are then drilled. Alternatively flanges can be pre-fabricated and bonded on. 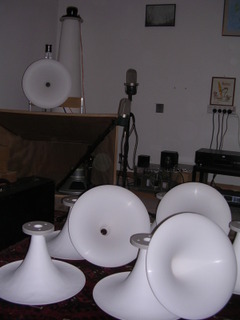 Horns are packed safely in strong custom made cardboard cartons, wrapped in bubble wrap and nested.